Whoa, rider... Curb straps and curb chains have a purpose of working with a bit to make that horse stop, but they need to be comfortably placed, cause most times, we want to go! All this, while the bit is pulled toward the poll with only one wrinkle on each side of the mouth. If using a hackamore, start with the same 4 finger rules. Pressure should be signaled, then applied, whether the pressure is in the mouth, over the nose, or at the curb, or poll. General rules: Leather straps are less severe than chains. Single chains are more severe than double link chains. Chains that can twist flat, or be scrambled, are very gentle when flat and increase in severity as twists are put in. 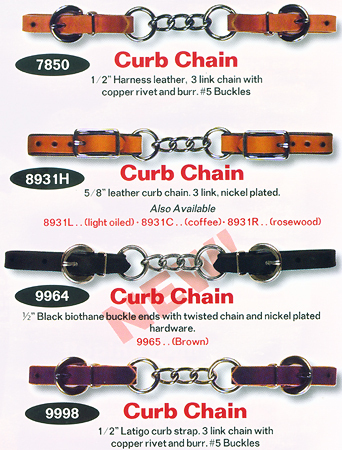 English type curb chains with the stainless hooks are a favorite training device in both English and Western worlds. They react and release fast. They fit on smaller bit loops. If your horse will not turn or stop, use a drop noseband, before you try tightening the curb more than 3 fingers flat. Ponies need pony straps. Yes, a hay string will work. Reinsman even has rope end chains. Buckles should normally be placed away from the horse. Quick links will substitute for English type curb hooks. Logging chains are overkill, usually! 7810 Curb Chain 1/2" Harness leather. 3 1/2" nickel plated flat link chain. 7820 Curb Chain 1/2" Harness leather. 3 1/2" stainless steel flat link chain. 9961 Curb Chain 1/2" Black biothane ends. Flat twisted stainless steel curb center. Stainless steel buckles. 9997 Curb Chain 1/2" Latigo leather. 3 1/2" stainless steel flat link chain. 8930H Curb Chain 5/8" Skirting leather. 3 1/2" nickel plated flat double twist chain. 7850 Curb Chain 1/2" Harness leather. 3 link chain with copper rivets fastening ends to chain. 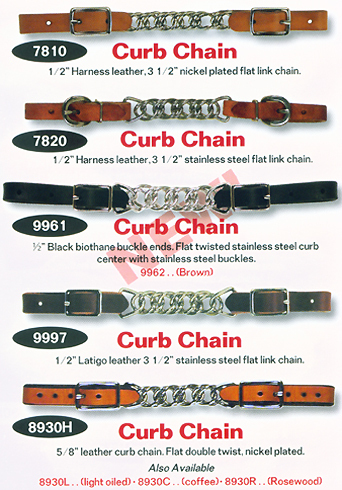 8931H Curb Chain 5/8" Skirting leather. 3 link nickel plated chain. 9964 Curb Chain 1/2" Biothane buckle ends with 3 link chain. Nickel plated. 9998 Curb Chain 1/2" Latigo leather buckle ends. 3 link chain with copper rivets fastening ends to chain. Nickel plated. 7800 Double Curb Chain 5/8" Harness leather. 3 1/2" nickel plated double flat link chain. 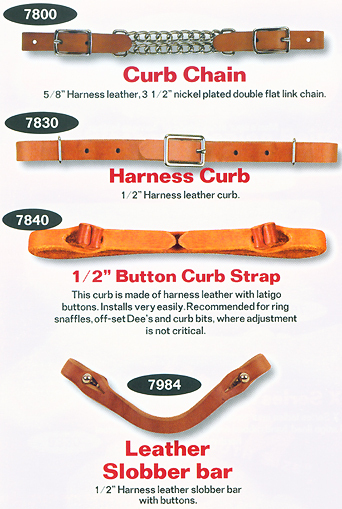 7830 Curb Strap 1/2" Harness leather. Adjustable strap with metal keepers. 7840 Button Curb Strap 1/2" Harness leather with latigo buttons. Installs easily, Recommended for ring snaffles, off set dees, and other bits where adjustment is not critical. 7984 Leather Slobber Bar 1/2" Harness leather. Buttons. Use to connect the bottom rings of bits. 9995 Cowboy Curb Latigo 1/2" Latigo leather. Adjustable strap. Easy to slide and adjust through the ties. 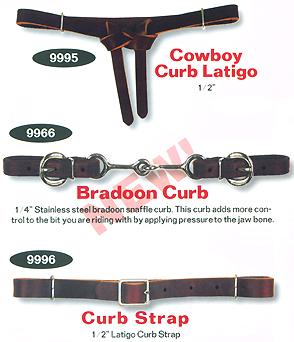 9966 Bradoon Curb Strap 1/4" Stainless steel bradoon snaffle curb. Adds more control to the bit by applying pressures to the jawbone. 9996 Curb Strap 1/2" Latigo leather. Adjustable strap with metal keepers. 1004 Curb Chain Surprising little curb chains with a lot of whoa. Easily tie to adjust fit. Nickel plated. Crimped. 1005 Hackamore Curb Chain Surprising little curb chains with a lot of whoa. Easily tie to adjust fit. Nickel plated. Crimped. Once you place either curb hooks in position, use offset channel locks or vise grips to squeeze the metal around your bit. We suggest squeezing the curbside drop too. On the off side hook, squeeze to the point it is difficult, but you can pull the chain link in and out. On the near side, be almost that tight, not quite. This way, even in a head shaking accident, you will not loose your chain, and you can take it loose to make it easier to pull your bridle on and off. 1006 Curb Chain with Hooks Double twisted English style stainless steel curb chain. Most adjustable. Connect with hooks or quick links. Twist from flat to severe pressure. 1011 Quick Links Twist the barrel to open and close. Put barrel to the outside of the horse's jaw. Priced per pair. 1002 Slobber Bar 3/16" Use to connect the bottom rings of bits. Especially popular with hackamore bits.